Musings of a Menopausal Melon - mmm! 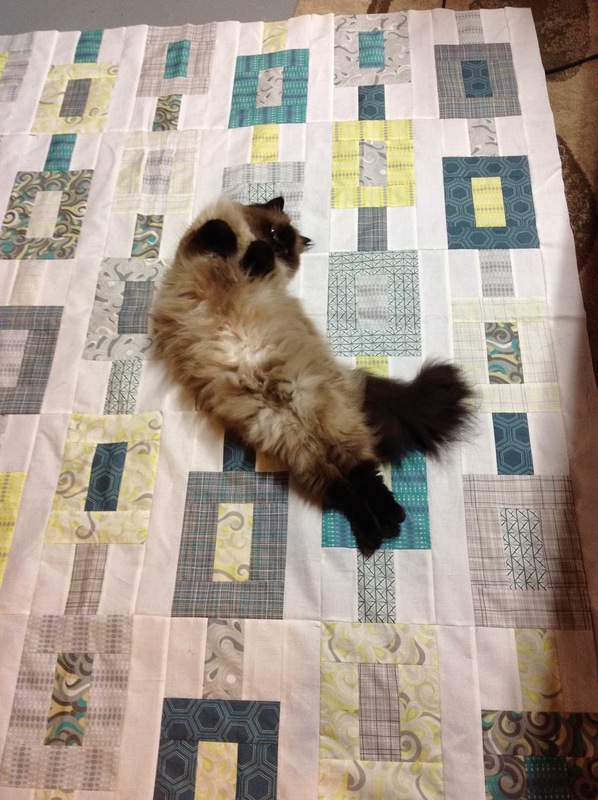 quilts: Pets on Quilts --Cats! I heard about this fun Pets On Quilts linky party over at Lily Pad Quilting from my friend Judy who blogs at Quilt Paradigm. Thank you Judy! She is the one who tagged me to participate in the Around the World Blog Hop. My post was last Monday, August 4, and the three lovely ladies I have tagged will be posting tomorrow. I will give you links to their posts tomorrow! So this is a linky party I am WELL-prepared for!! As many of you know, I have a Pitbull named Rocco. Before I got him, and before I started watching Cesar Millan rehabilitate other dogs under the guidance of (I'm dead serious) his Pitbull, Daddy, I, too, had a bit of a whoa-keep-your-distance-scary-pitbull attitude towards these people-(especially kids)-loving, life-loving, joyful dogs. He, too, loves quilts. Especially quilts on a human bed. He has been known to photo-bomb a picture or two for my blog. "Back off Bella, I'm claiming this one"
However, this entry is my CAT on quilt entry, so if you want to read my DOG on quilt entry, click here! When I wrote it, I had no idea I would be entering him into this party, and it is quite interesting how many pictures I have of him on one of my quilts! 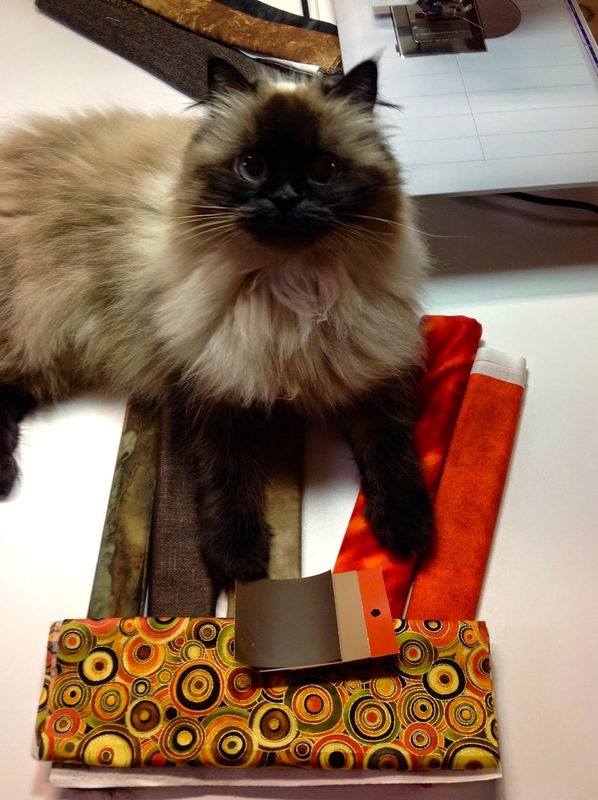 So I also have a gorgeous cat named Bella, who is my sewing diva partner. This post is my entry for her into the POQ Festival. I would say she loves new fabric as much as I do. She, much like me, loves the feel of fabric, loves the feel of a quilt, either burrowing into it, or lounging on top of one. "Must you take more pictures? How absolutely boring of you..."
We got her in October of 2012, when she was 6 months old. 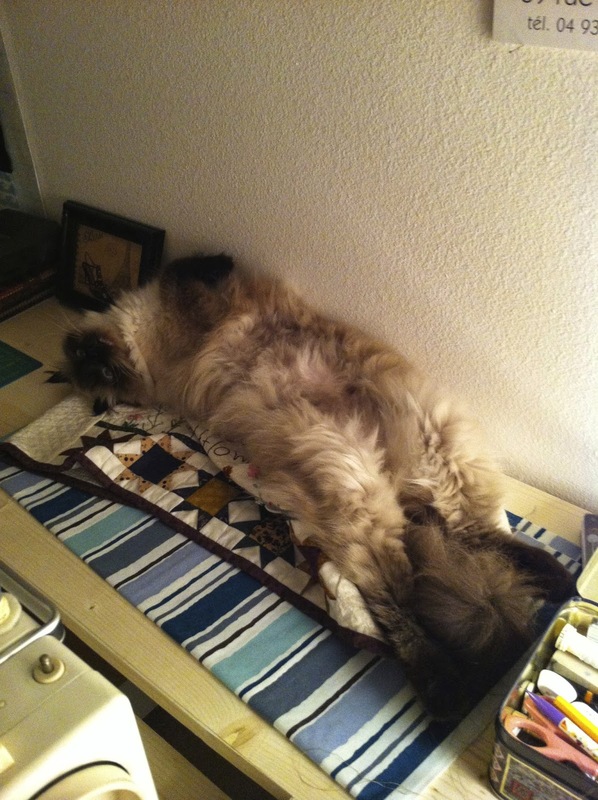 She is a Himalayan. She loved quilts and was fascinated by my sewing space even at that young age. 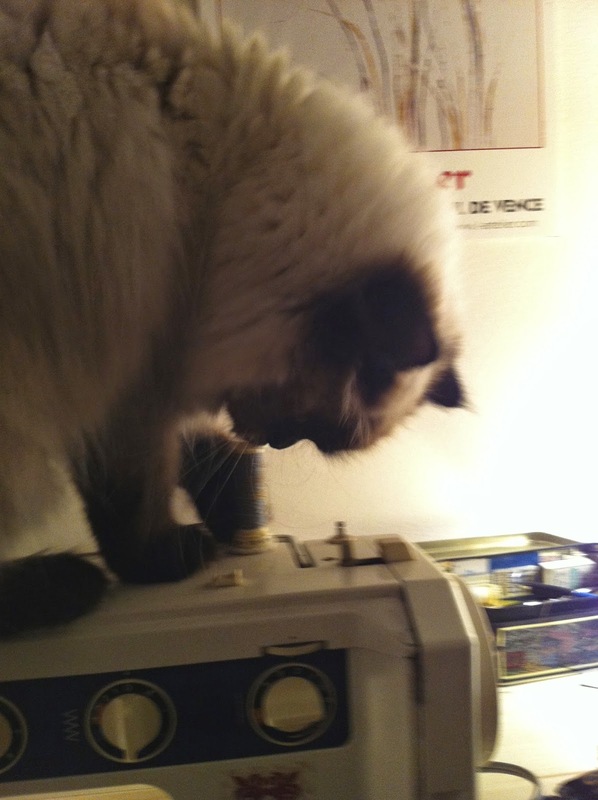 This past winter in Florida, she was quite intrigued with my old Elna sewing machine that I keep there. She also loves keeping her spine in shape on my sewing machine cover, and, yep, new fabric underneath. Think I've got my toes on it...yep, just! 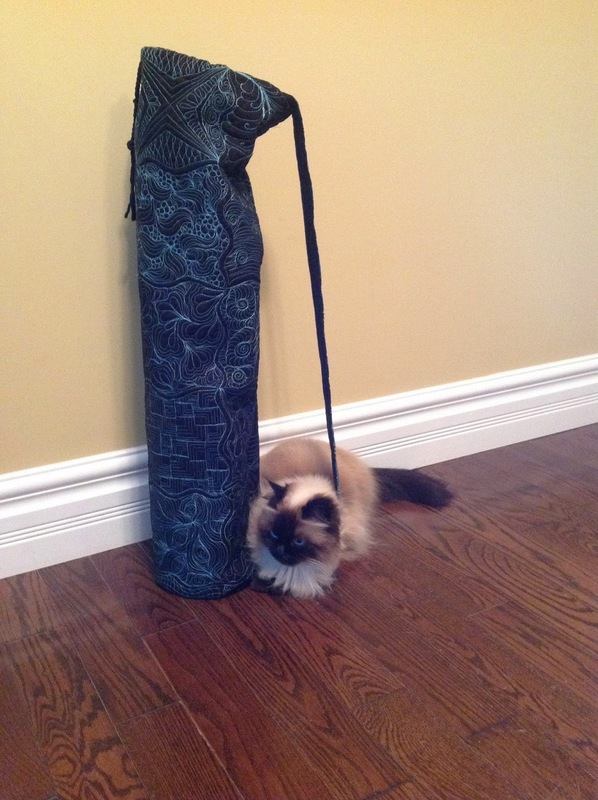 This is my yoga bag I free-motion quilted. I stood it up here after I'd taken some outside shots of it. Turned around, and look who managed to get herself ON a part of it. It was only the quilted strap, but hey, she got ON a part of that baby! She's my cheerleader when it comes to being in my quilting/sewing space. She bubbles with feline energy, all wiggly and bouncy, wriggling like a caterpillar on the carpet beside me, whenever I go down to the basement to sew. Here's one last shot of her from a few moments ago, showing off her flexible spine and body. Okay, she says that wasn't her good side. Do you see how she just loves to pose?! Typical cat, no?! It's kind of funny the way they think we make quilts for them...isn't it? She is a really pretty cat and something of a diva I think! She is so beautiful! I'm jealous she did such a great job posing on your daybed! My cats were not cooperative at all! She is quite the ham! ha! great pictures! Your quilts are beautiful and so is that cat. She seems to love the camera with all her sweet poses! Oh My! Bella is a gorgeous girl Sandra! And the quilts you have made - I am so impressed! Rocco and Bella seem like quit the siblings! I guess you never know what is going to happen! They are adorable plus I love all your quilts! It must be so much fun to have such a beautiful sewing partner, she poses so well on the quilts. Ha Ha!! Love the stretched out pics!! Precious! Bella has a wonderful face! What a beauty! Love the photo of her staring straight at camera with the maple leaf in front! Bella is beautiful. My cats show up whenever a quilt is put down for measuring too. I feel if they do not check out the quilt, I must have done something wrong with it.